Growing up Peeps were always a holiday staple at our house. Every Easter we would get a basket that always included the traditional pastel marshmallow puffs. But did you know Peeps are available at other holidays too? 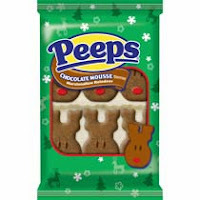 Peeps has a huge variety of Christmas/Holiday peeps in flavors like: Gingerbread, Chocolate Mousse, Candy Cane (dipped in chocolate!) and mint chocolate marshmallow. 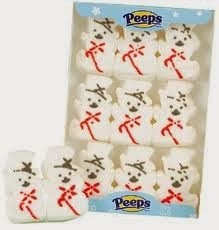 Peeps come in 6 ct packs, 3 ct packs, in Peep pops (4ct) and individually wrapped. 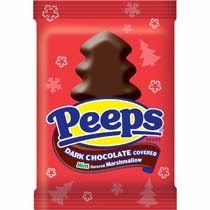 Have a Peep lover in your family? You can buy a bucket of Peeps from their web site! I love Peeps, and sure wouldn't mind having that around! My favorite of the holiday flavors is the gingerbread! The flavor is great, and the "men" are so cute! I love putting these out on a plate during a holiday gathering - they make a cute snack and double as a decoration! (Wouldn't they look festive outside your gingerbread house!?) Of course they have traditional marshmallow flavored Peeps at this time of year too, but in sweet holiday shapes like Christmas trees and snow men! How cute would these be when used to make smores? Or dunked in a mug of hot chocolate? So fun and festive! Have you finished shopping for stocking stuffers yet? Will you put Peeps in your stockings? Let me know!